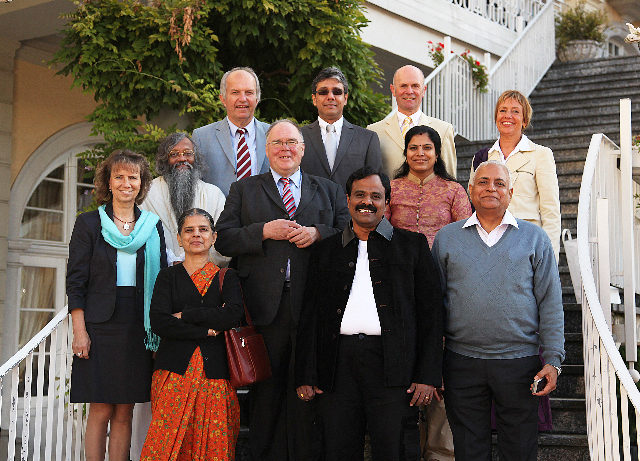 The Health Minister of the Indian government meets leading Maharishi Ayurveda representatives in Bad Ems. A high-ranking delegation of the Indian government visited the Maharishi Ayurveda Health Centre in Bad Ems on Friday, October 9, 2009. The delegation included Mr. Sh. S. Gandhiselvan, Health Minister of State of the Indian Government, accompanied by Ms. Jalaja, Secretary General of the Health Ministry of AYUSH (Department of Ayurveda, Yoga & Naturopathy, Unani, Siddha and Homoeopathy), as well as Mr. Dr. Sharma, Ayurveda advisor of the Indian government. They were following the recommendation of Mr. Prof. Dr. Lavekar, the chief executive of the Central Council for research on Ayurveda. He initially visited Bad Ems Germany in September 2009 to personally get an insight into the development of Ayurveda in Germany. Leading representatives of the most important German association and corporation of Maharishi Ayurveda met with the Indian delegation, which visited Ayurveda organizations throughout Germany. In the meeting, which latest several hours, the discussion was primarily about the possibility of establishing Ayurveda as an alternative, holistic medicinal system of health care. Additional topics included exploring the possibilities of the expansion of scientific research about Ayurveda and the training of doctors. Two years ago, the then Indian health minister Ms. Panabaka Lakshmi visited Bad Ems. Ottmar Canz, mayor of the City of Bad Ems, was very pleased about the continued relations between the Indian government and the Ayurveda Health Centre. He cordially greeted the new delegation in a brief welcoming speech, presented the guest with a gift and received a present in return.